Thanks to Jason/NT7S for enabling my growing homebrew electronics ambitions. I now have a bunch of stuff to add to the workbench. There’s this big bag-o-parts to augment the parts bin. 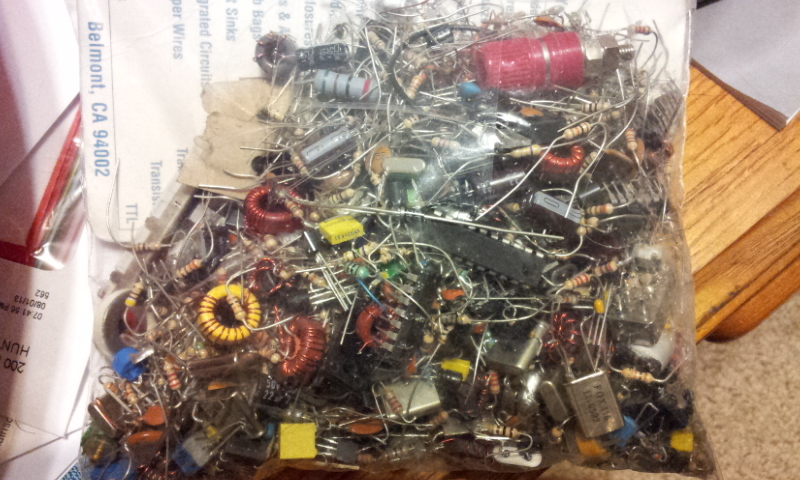 It’s filled with resistors, capacitors, diodes, transistors, inductors, ICs and crystals. He also sent along a first version of his HF return-loss bridge kit and an M3 frequency counter/power meter for the workbench. With the return-loss bridge, frequency counter/power meter, a signal generator and oscilloscope, Jason tells me I’ll be able to make all kinds of measurements for testing and characterizing circuits. I guess I’ll need to spend some more time with the Heathkit signal generator to see how operational it is. I’ll also need to pick up some BNC connectors and jumper cables. Jason also recently acquired a couple of TI Tiva Launchpad boards, so I got his surplus TI Stellaris LM4F120 and MSP430 boards to play with. Not quite sure what I’ll do with them yet, but maybe they’ll push me to brush the cobwebs off the C I’ve learned. I also received most of the components I’ll need to build some version of a sound card interface that I can use to connect to the radio for using digital radio modes. I think I’m going to have fun working on that project.